Young Bangla collaborates with the government’s ICT Division to set up countrywide computer and language training labs called Sheikh Russell Digital Labs (SRDLs) to develop Information Technology (IT) and foreign language skills among school & college students. The initiative of SRDLs is an addition to ‘Digital Bangladesh: Vision 2021’ target of Bangladesh Government. The list of 2,901 educational institutions across the country has been finalized for setting up the computer labs and 64 educational institutions of 64 districts for the language training labs. Digital labs are being established to provide school and college students with digital literacy having the scope to develop themselves as the digital generation from their early school life. The students will also get an opportunity to improve their skills on foreign languages as the language training labs will introduce nine languages to learn. Bangladesh is enjoying a demographic dividend as the government is working to develop the educated youngsters as skilled manpower of the 21st century by providing the digital literacy. 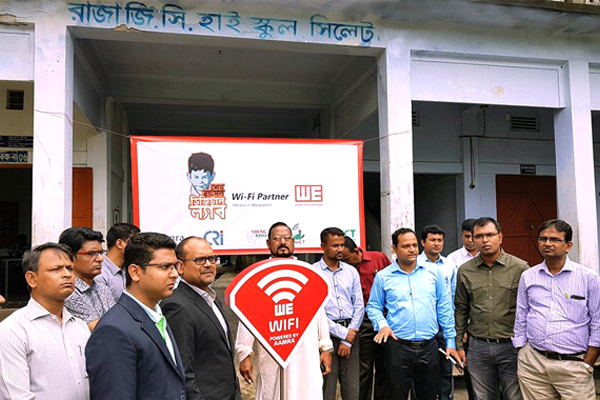 aamra companies under the CSR initiative of ‘Believe in Bangladesh’ (led by its HR Team) is contributing in SRDLs project by providing high speed WE Wi-Fi connectivity in 200 education institutes across the country. In this spirit of continuous technological enhancement in Bangladesh, aamra has established the most wide-reached network of WiFi hotspots in the country for past couple of years. So far, WE WiFi has been established in various locations of Dhaka, Manikgonj, Tangail, Chittagong, Cox Bazar, Noakhali, Rajshahi, Natore, Rangpur, Jessore and Sylhet. aamra targeted rural areas where Internet is not easily available and students are struggling to get facilities of efficient digital learning environment. This concern also resonates in the lower tiers of education such as middle-schools and high-schools who are eager to digitize their contents, but are limited by the availability of internet connectivity. aamra believes that the future of Bangladesh is exciting and connecting the millennials to the information high way would be instrumental to it. The initiative of WE WiFi activation in SRDL school has started with Sylhet, the Land of Hazrat Shah Jalal & Hazrat Shah Paran.